It’s been almost two years since gay marriage was legalized across all 50 states, a huge nationwide victory that was a long time in the making. But obviously it’s just one component of an exciting art form that’s been even longer in the making: The gay marriage proposal. 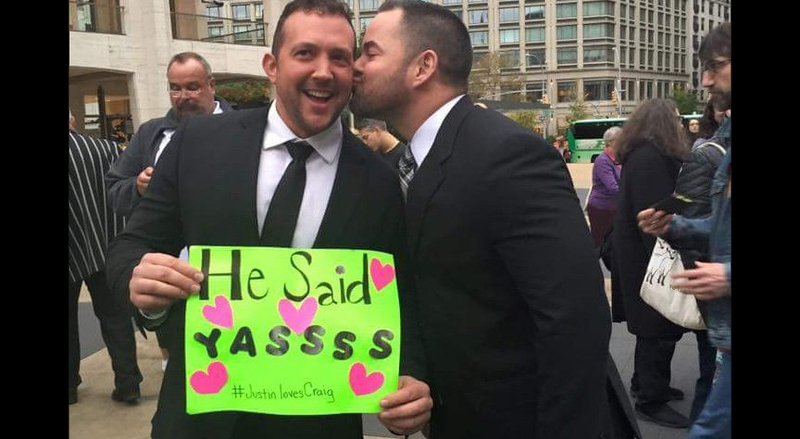 The question no one is asking: Why are gay marriage proposals so fabulous? The answer: Personally, I like to think that each marriage proposal made in the wake of our new freedom to marry carries within it all the pent-up desire of the tortured years before. Those years when marriage was too much to hope for, or too far away to think about. Now that queer people are allowed to have a legally sanctioned future together, the excitement at the prospect is bursting over in every mob rush proposal, every public declaration of love, every show-stopping interval. Drag Stars at Sea contestant Vivienne Pinay gets a splashy surprise after her boyfriend followed up a slideshow of the two of them with a proposal. Nothing says romance like a PowerPoint. 4. Let’s Make It a Musical! At a Canadian production of Joseph and the Amazing Technicolor Dreamcoat, the show’s star came out to propose, buffered by a horde of backup dancers, to propose to his boyfriend a la musical medley. Obviously we can’t just leave it at that. One good musical turn deserves another. This lucky guy thought he was being dragged to Home Depot to look at paint swatches. What he got was an elaborately choreographed dance to Betty Who, followed by a popping of the question. Saint Kylie gave the floor to a gay couple on tour in Perth. The lovers of nine years made it official that day, in front of a witness of hundreds. During a concert in Denmark, Adele invited two lovers onstage, gave them the floor, and afterward asked if she could be a surrogate to their baby. If anything has ever earned the glowing heart emoji, it’s this video. Seriously, try not to cry. Well, gentlemen, it’s officially on. See if you can top these.